For the past 16 years Yesterday’s Dreams has been offering clients from near and far and from all walks of life an array or ornaments, porcelain, glass, silver, plated ware, jewellery, paintings, Victorian clothing, period furniture and gorgeous French antiques – a wonderful shopping experience for those who love fine things! 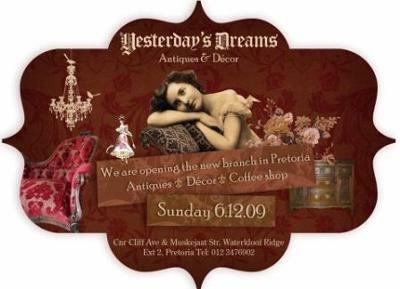 We are happy to announce that a brand new Yesterday’s Dreams branch, in Pretoria is opening on Sunday December, 6th 2009. Come and browse the new stock and enjoy a drink and a snack in our coffee shop.